Some months ago, my friend Nacho gave me as a gift 75€ to be used in AdWords campaigns. I set up 3 of them: 2 of them promoting 2 Toastmasters clubs, the third one promoting this blog. According to the campaign report the blog received 1,410 visits from the advertisements. The campaign ended in July and cost 51.96€; thus the average cost per click (CPC) was 0.037€. I plotted in the following graphic what the total visits per month have been (blue line) and the total visits less the ones that originated from AdWords ads (green line). You can see the big impact of the campaign: so far 26% of the visits came from it (since February, when I started the blog, to the end of November the blog received 5,434 visits), while the campaign was active up to 48% of the visits came from it. 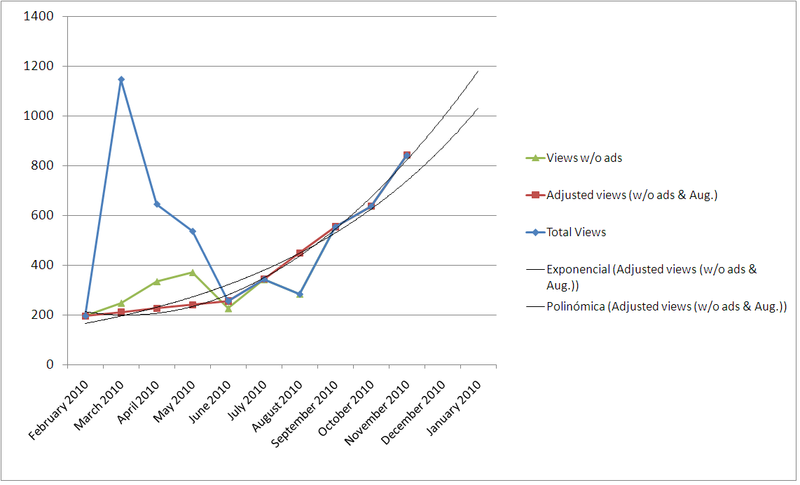 Discounting the campaign (green line) we can still see that the pattern of the growth is not as smooth as we would expect. That is why I linearly interpolated visits from March to June (and in August, where you see that due to the low activity of the blog – holidays – there were less visits than the trend) and plotted the red line (adjusted). Finally, I tried to see what trend line adjusted better to the growth of the blog, using the adjusted red line, and even though now it seems that follows closely a second grade polynomial I guess the evolution of the blog should follow an exponential (if any). It could be predicted that the blog should have ~850 visits in December, and in January ~1,000, a year after it started (if indeed it follows the exponential pattern of evolution)… we’ll see.